Scrabble updated their official Dictionary to include new words from pop-culture like twerking (you know what that means), Ridic (short for ridiculous), lolz (which not even my auto-correct understands). This should make my next Scrabble game really fun. I’m a challenger. I find some of these additions totally Ridic! Dave Letterman retired and his final show got the highest rating since 1994 – almost quadruple the usual number of viewers. Not surprising. Seems the best way to get everyone’s attention is to announce that you are going away. The story of the $30 hot dog. So $20 for a chicken tenders and fries is okay at the Yankee Stadium but $30 for a hot dog and pretzel outside the World Trade Center is Ridic? I’m not mad at the vendors. If you’re hungry enough, and don’t want to walk the few feet to another stand, you’ll pay. Or challenge the vendor, like the people in this news report did. President Obama finally getting his own Twitter account. Of course, I’m following him @POTUS… me and 2.3 million other people. 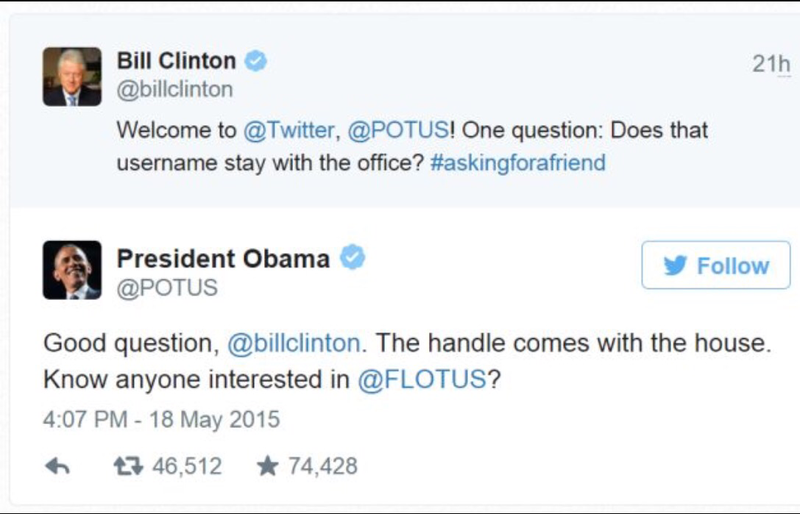 I loved this twitter exchange between him and Bill Clinton on his first day. What are you talking about this weekend?